The following article is a guest post from my college freshman brother, Ryan. 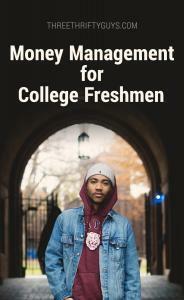 He provides some great insight into how to manage your money on your own during your college years. When I was ready to start my freshman year of college this year, there were so many things that I was worried about. Where am I going to live, am I going to fit in or am I going to have friends. There were also a lot of things that I was exciting about, and the main thing that I was excited about was this new thing that I was going to experience which was called complete and utter INDEPENDENCE! I was so excited to finally be able to call my own shots like when I was going to go to bed, when I was going to eat, what I was going to eat, and when I am I going to study. There were so many new opportunities that I was so excited about. I finally was going to be free from my parents. However, there were some downsides to independence, and one of the main downsides was called money management. In high school, very little was expected out of me as far as taking care of my own expenses. My car would be fueled up when I woke up. Eggs, bacon, and orange juice were ready when I woke up as well. If I had any need that had to do with shelter, food, and some luxuries, they were usually taken care of. I had little need to think about money, and how it affected my future. Don’t get me wrong, I enjoyed the luxuries of money, and spent some hours working to earn some, but most of it was used on my own wants, like golf clubs, Mexican food and workout supplements. All of which are great choices if you want to lose a little cash! Nevertheless, the world that I used to know was about to crash down. So, during the first month of college, everything was going fine and dandy until I received a phone call from my dad telling me that I had an overdraft. I believe that for the first month I had about four hundred dollars in my checking account. Good thing my dad didn’t know that! He just knew that I had an overdraft. Even though I had an overdraft I didn’t think much of it. I just thought that it was the cost I had to pay to fulfill my needs. So eventually at the end of the semester I was almost out of money. I am not going to say how much just because my parents might read this! Nonetheless after the first semester I decided to get a job at Fastenal, a manufacturing retail supplier, in Sioux City, and after about 4 months of hard grueling labor, I pulled myself out of the trench of lowliness and college student poorness. Not only did I work, but I learned many new money saving techniques along the way that I think can help readers. Now that I have told some of the readers part of my story, I would like to explain how I have been able to save money in college, and how to possibly encourage your kids to do the same. Keeping track of your expenses is one of the greatest ways to learn how to control your spending. I found a cool app on my smart phone called iSpending and I would write down how much I would spend every time I would make a purchase. The other cool thing about this app was that people can write down what category a purchase is under. (Like for example if someone were to buy milk, the category would be food). The reason the category feature can be helpful is because the app puts the category into a pie chart and users can see what a majority of their purchases are going towards. I strongly recommend this app because I think that when people are able to truly look at their purchases, they are more likely to take a step back, and look to see if they really need that product. This one goes along with the first topic because it still has to do with the fact that people are seeing how much cash they are using for something. This is very important because when lots of kids are going to college they use credit often, and don’t really look at how much something is, they just decide on whether they want it or not. For me I tried this technique of using more cash, and it really did work. Every time I would use cash it was like someone was pulling my fingernails off. I didn’t want to do it because I knew how hard it was to earn money. Here’s a funny story that shows my point, when one of my friends in my hall had to go coat shopping for the first time, he bought his coat with credit. He didn’t really even look at the price tag he just saw that it looked cool. This bought a nice Under Armor coat for about 250 dollars, when he could have bought an equally good one for probably 75, that would have gotten the job done. However, all he saw was a cool design, and an easy swipe of the card. So remember CASH NOT CREDIT!! Creating a budget isn’t as hard as it seems, when I was looking at creating a budget it looked like a daunting task that I was not going to be able to create. However, it was quite easy with the help of my iSpending app. What I did was I look at the data from my first month chart and looked at the categories where I was spending. I looked at little things that I could reduce and cut down on. I looked at how much I needed for gas, food and little luxuries (likes dates and stuff). 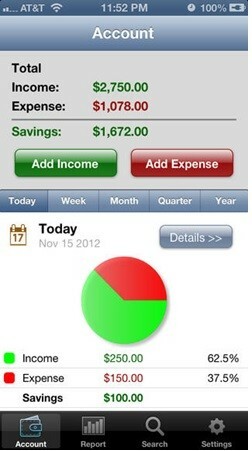 While making this budget I was able to save around 400 dollars a month and still have fun in college. Here’s one last money saving tip: DO WELL IN COLLEGE! This is probably the greatest tip of all. Your parents as well as the students are investing a lot of money into the future. Don’t waste the money invested!! Do you have tips to practice good money management in college? In college your budgets are so simple. It’s definitely better to get a handle on your budget then as opposed to when you are 25 years old! It’s amazing how much a simple budget does when it comes to managing money. Thanks for the great tips, I’m sure they will help tons of people! There is not a day goes by that I don’t wish I was taught better money management early on in life. Great advice! I think the best thing to fill young college freshmen in on is just how impactful saving will be in the long run. If you start saving younger and put that into an IRA you will have MILLIONS when you are ready to retire. Like Aaron wrote about a few weeks back, I think financial education in our schools is severely lacking! How did you learn your money management skills? Parents? Friend? My younger sister who is a second year Nursing this school opening, sometimes, I think she forgot that she is still studying because she really loves material things. We are not a fan of credit card and we don’t even own one “thankfully”, we just give her an allowance every week. Great advise, but I use reward points credit cards instead of cash and collect almost 5% return with those points. Everything in our mind. If you have control in your spending, you can use credit cards.